"We are so sorry to hear of Joan's passing. She was such a..."
"I am so sad to hear of Joan's passing. 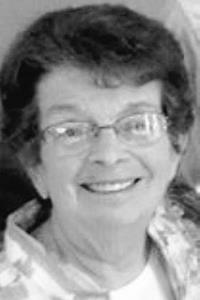 She lived across..."
MARYLAND - Mary "Joan" Hodgdon (Martin/Knowles) peacefully passed away after a long illness of Dementia/Alzheimer's at Lorien Skilled Nursing Home in Maryland. She was born Aug. 30, 1932, in Portland, Maine. She was the daughter of Mary (Cady) and Claude Martin. She was so proud to say she grew up on "The Hill" (Munjoy Hill) where she attended Jack Jr High and was a member of the Portland High School class of 1950. Joan was predeceased by her parents; sister, "Dottie" Day; brother, "Billy" Martin; son, Warren "Bud" Knowles; husbands, Warren Knowles and Kenneth Hodgdon. She is survived by daughter and son-in-law, Cheryl and Andy Quatrano of Elkton, Md. ; daughter-in-law, Kathy Knowles of Conway, S.C. She was known as "Gam" to her six grandchildren, Bob (Suzanne) Lewis, Gianni (Joey) Quatrano, Scott Knowles, Krista (Eben) Zeh, Kara (Brian) Poulin and Amy (Wayne) Lorandeau; and eight great grandchildren, Parker, Maranda and Joshua Lewis; Cody Poulin, Micha and Ava Zeh, Andrew and Riley Lorandeau and several nieces. Her family wishes to give special thanks to her best friend of over 50 years, Arlene Dougherty, who was her "Guardian Angel" and by her side to her last day, and Mary and Roland Lemay for providing a loving home for her daughter's stays during her many visits from Tennessee and Maryland; as well as all her school mates, Red Hat Tomatoes Ladies, friends and co-workers. A celebration of life will be held later this spring or summer, where her remains will be brought "home."